Native to Asia, Europe, and the Indian subcontinent. Introduced and naturalized in North America. Dry. Open, upland areas, prairies, disturbed sites, roadsides. Full sun or partial shade, never full shade. This is a 1′ to 6′ tall, erect, freely branching, biennial forb rising on many stems from a strong taproot. The stems are branching, light green, and hairless. The taller plants tend to be bushy, the shorter plants lanky. In the first year they are small and do not flower. In the second year they are taller, bushy, and produce many flower clusters. 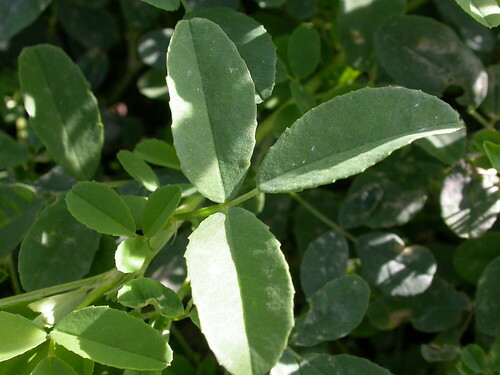 The compound leaves are alternate, hairless and divided into three leaflets.The leaflets are oblanceolate or obovate, ½″ to 1″ long and up to ¼″ wide. They are plain green, finely toothed along the middle and upper margins, the teeth pointed outward rather than forward. The middle leaflet is on a distinct stalk. White sweet clover (Melilotus albus) has white flowers. It is usually a little taller than yellow sweet clover. The foliage is grayish-green, not plain green. It blooms 2 to 3 weeks later than yellow sweet clover. 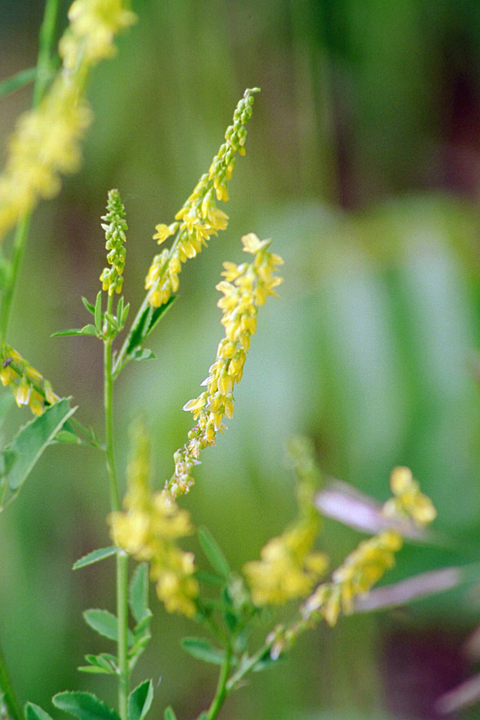 Some authorities consider white sweet clover (Melilotus alba) and yellow sweet clover the same species with differently colored flowers. Most authorities, including Gleason & Cronquist (1991) and Mohlenbrock (2002), treat it as a separate species. Introduced taprooted biennial herb, stems often to 1 m tall or taller, leaflet margins serrate at least distally, flowers with yellow petals, pods inconspiuous, with 1 seed, common along roadsides, in fields, grasslands, and rangeland where overgrazed or intentionally seeded, does well where disturbance is regular, although seedlings, but not adults, are common in well managed sagebrush steppe. 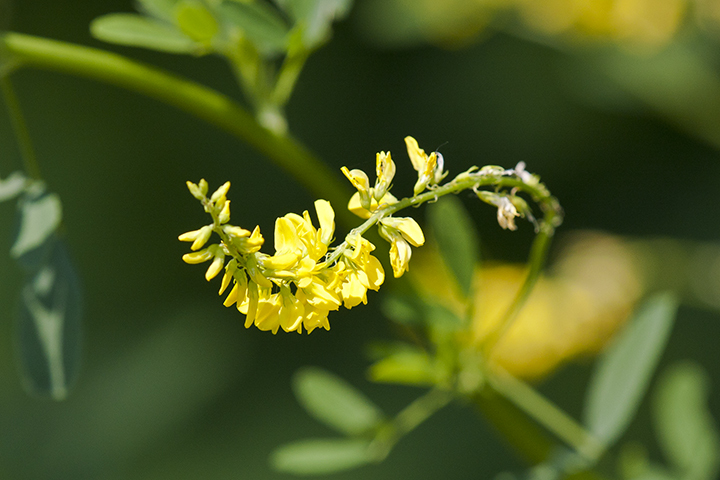 De citroengele honingklaver (Melilotus officinalis), ook vaak Akkerhoningklaver genaamd, is een tweejarige- of meerjarige plant uit de vlinderbloemenfamilie (Leguminosae). 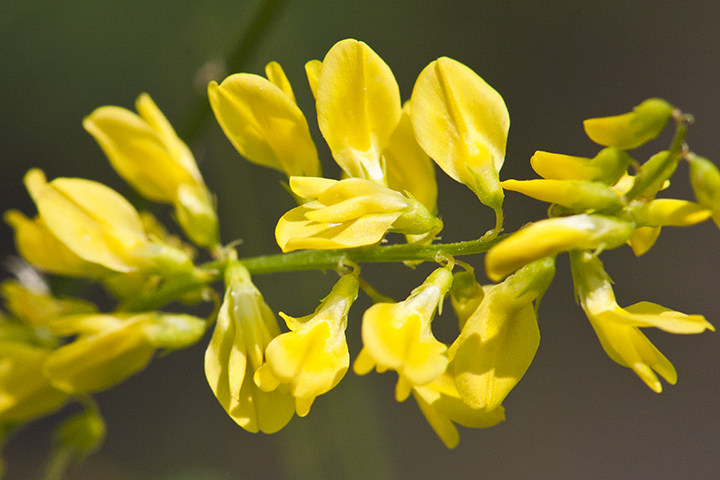 Melilotus officinalis, known as the yellow sweet clover, yellow melilot, ribbed melilot or common melilot is a species of legume.